Gel nails last extra long, so for lazy people like me gel nails are a great option. I think getting gel nails every second is probably not good. Moderation is key to a healthy life. 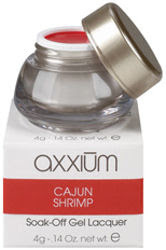 Here is a great gel nail polish option for the summer: Caijun Shrimp by OPI. Ciajun shrimp is light red nail. I believe it can be considered a coral nail color polish. I absolutely love this color. It is great for nice hot day that involves sipping a cold drink on a trendy restaurant patio. Since gel nails are more stronger than nail polish, when you rip it off by biting or by scrapping it you will end up ruining your nails. This definitely needs to be avoided. If you want to remove your gel nails, go see your manicurists or nail technician to have them clean off the old gel nails. To remove gel nails, acetone is used. This can irritate the skin around the nail. In addition, UV light is used to cure the gel nails. So too much too often is definitely not good for your skin. Doing gel manicures 3 to 4 times a year is probably okay. But, you should probably realize that it can irritate your skin and weaken your nails. So avoid try to remove the gel nails yourself and visit a dermatologist if you see any type of skin irritation. Recently I was stuck with a bunch of parties and a ton of spring cleaning around the house to do. And every time I do some cleaning around the house, I always ruin my nail polish. So this time I went to the nail technician and got some gel nail polish applied. So far its lasted an entire full week which included a hectic work week, a wedding, scrubbing the floors and cleaning out the garage. Gel nails are great as they are super strong and last about 3 weeks. The extra cost in getting them done is definitely worth it especially if you will not have the time to do your nails every week. Gel nails are also a lot better for your nails. I have been super busy over the last 2 months and I haven't much time to post anything new. Well, I am finally at my computer and I going to list some new summer shades that I think are great fun. Chanel came out recently with a dark beige called Terrana, a fun turquoise called Mediterranée, a bright red called Coquelicot and a summery purple called Lavanda. Essie has a couple of new collections like flowerista, cashmere matte and sunday funday. I think these three collections have some really great summer shades. I personally like the lavendar/purple shade called flowerista, the light turquoise/green shade called blossom dandy and the fuschia called double breasted jacket. If you have any suggestions of fun summmer shades to where during the next couple of months, please leave a comment. I will be doing another nail polish giveaway soon. I will be giving away a set of 3 nail polishes that are fun, bright and a must for any makeup collection. If anybody has any suggestions, feel free to leave an idea of a nail polish color that is good for those hot summer nights. I have had serious nail biting issues all my life. I tried so many things to stop biting but nothing really lasted. I tried drinking more water, exercising more, tarot cards and various anti nail biting solutions. Only 1 anti nail biting solution actually was effective. But the best thing to do to avoid biting your nails, at least for me, was to keep them polished. I guess having nail polish on my nails makes me think I am all dolled up. And you don't bite your nails when you're all dolled up. Like seriously. But obviously if I bite my nails, my nails are often short. 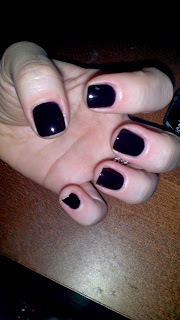 I have always found that dark colors look great with short nails. The main reason is because dark colors will hide imperfections and unevenness. But you do have to be careful when chipping your nail polish. It will show a lot more than a light color nail polish. 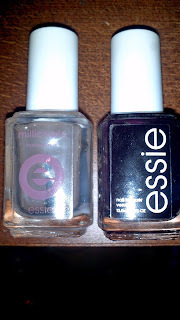 This nail polish is Devil's Advocate by Essie with a top coat/nail strengthener also by Essie. So remember with short nails go dark.